O sacred, wise, and wisdom-giving Plant, mother of science, now I feel thy power within me clear; not only to discern things in their causes, but to trace the ways of highest agents, deemed however wise. Queen of this universe, do not believe those rigid threats of death: ye shall not die. How should you? By the fruit? It gives you life to knowledge; By the threatener? Look on me; me who have touched and tasted, yet both live, and life more perfect have attained than Fate meant me, by venturing higher than my lot. Shall that be shut to Man, which to the Beast is open? Or will God incense his ire for such a petty trespass? And not praise rather your dauntless virtue, whom the pain of death denounced, whatever thing death be, deterred not from achieving what might lead to happier life, knowledge of good and evil; Of good, how just? Of evil, if what is evil be real, why not known, since easier shunned? God therefore cannot hurt ye, and be just; Not just, not God; not feared then, nor obeyed: Your fear itself of death removes the fear. Why then was this forbid? Why, but to awe; Why, but to keep ye low and ignorant, His worshippers? He knows that in the day ye eat thereof, your eyes that seem so clear, yet are but dim, shall perfectly be then opened and cleared, and ye shall be as Gods, knowing both good and evil, as they know. That ye shall be as Gods, since I as Man, internal Man, is but proportional meet; I, of brute, human; ye, of human, Gods. So ye shall die perhaps, by putting off Human, to put on Gods; Death to be wished, though threatened, which no worse than this can bring. And what are Gods, that Man may not become as they, participating God-like food? 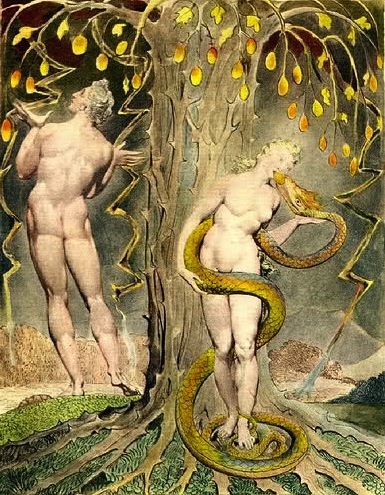 The Gods are first, and that advantage use on our belief, that all from them proceeds: I question it; for this fair earth I see, warmed by the sun, producing every kind; Them nothing: if they all things, who enclosed knowledge of good and evil this tree, that whoso eats thereof, forthwith attains wisdom without their leave? And wherein lies the offense, that Man should thus attain to know? What can your knowledge hurt him, or this tree impart against his will, if all be his? Or is it envy? And can envy dwell in heavenly breasts? These, these, and many more causes import your need of this fair fruit. Goddess humane, reach then, and freely taste! Great are thy virtues, doubtless, best of fruits, though kept from man, and worthy to be admired; Whose taste, too long forborn, at first assay gave elocution to the mute, and taught the tongue not made for speech to speak thy praise: Thy praise he also, who forbids thy use, conceals not from us, naming thee the tree of knowledge, knowledge both of good and evil; Forbids us then to taste! But his forbidding commends thee more, while it infers the good by thee communicated, and our want: For good unknown sure is not had; or, had and yet unknown, is not had at all. In plain then, what forbids he but to know, forbids us good, forbids us to be wise? Such prohibitions bind not. But, if death bind us with after-bands, what profits then our inward freedom? In the day we eat of this fair fruit our doom is we shall die! How dies the Serpent? He hath eaten and lives, and knows, and speaks, and reasons, and discerns, irrational till then. For us alone was death invented? Or to us denied this intellectual food, for beasts reserved? For beasts it seems: yet that one beast which first hath tasted envies not, but brings with joy the good befallen him, author unsuspect, friendly to man, far from deceit or guile. What fear I then? Rather, what know to fear under this ignorance of good and evil, of God or death, of law or penalty? Here grows the cure of all, this fruit divine, fair to the eye, inviting to the taste, of virtue to make wise: What hinders then to reach, and feed at once both the body and mind? So saying, her rash hand in evil hour forth reaching to the fruit, she plucked, she ate. Earth felt the wound; and Nature from her seat, sighing through all her works, gave signs of woe, that all was lost. Back to the thicket slunk the guilty Serpent.